The respective domestic and imperialist forces clashing on the streets over the management of Siberian gas and for the superiority of Europe as a geopolitical centre, have produced a worrying situation of crisis that could further escalate at any moment. Ukraine is one of the battlefields. The Ukrainian and European proletariat are the likely victims. Behind the politically confused events of the Euromaidan it is clear that in the Ukrainian crisis imperialism dominates. The main actors are the usual suspects: Russia, which is playing at home, and the U.S. which is always on the move. The supporting actors, such as Germany, enter the game not in the name of the EU but for itself, and China, although far away in terms of geographical distance and opportunities for action, follows with interest the movements of the Central Asian theatre. At the centre of the dispute are two interlinked issues, geopolitics and energy. The first actor is U.S. imperialism. After "the annexation referendum" in the Crimea, President Obama has demanded the exclusion of Russia from the G8, threatened in three distinct situations to organise economic and financial sanctions, as well as to appeal to NATO, if Putin continues his destruction of Ukrainian national integrity. From a geopolitical point of view the goal of the U.S. since the collapse of the USSR has been to complete the final destruction of “the evil empire”. Not only Moscow delenda erat*[i]* but also its old imperialist system, characterised by a number of satellite countries, had to be dismantled, to promote the inclusion of these countries in the Western European Union, under the economic and political aegis of the U.S.. In more recent times the programme of the White House was to completely isolate its former number one enemy, to carry out a scorched earth policy on the ruins of its former empire in order to prevent it from re-forming as the dominant force in the area thanks to its exports of raw materials such as oil and energy, especially gas. Whether supporting the "Orange Revolution" in the middle of the last decade, or in the recent events of the Euromaidan in Kiev, the pressure of U.S. imperialism has made its weight felt. Political forces like Tymoshenko’s "Fatherland", the openly fascist Svoboda, with their paramilitary structures C.14 and the "Pravyi Sektor" (Right Sector), have not only received inducements and political support, but also something more substantial. The failed Republican Presidential candidate McCain has undertaken extensive contacts with these forces on behalf of American interests with the obvious support of President Obama. Initially, as a result of the "Orange Revolution" of 2006, the instrument they used was an extensive network of NGOs under American control, and initiated by institutions linked to the U.S. government or major players in American finance. Among the best known, as well as the most efficient in Ukrainian society, is the Open Society Foundation of the ever-present magnate Soros, who since the "Orange Revolution” has built a small empire with substantial financial contacts amongst its politicians. In 2012 alone his organisation invested as much as 10 million dollars in various activities. Another important NGO playing a big role is the National Democratic Institute for International Affairs and the International Center forJournalism which is partially funded by Bill Gates. In addition, the U.S. Administration has maintained excellent relationships with some oligarchs who opposed the government of Yanukovich, hoping to have wider operational and commercial openings on the U.S. market. One of the few who have not acceded to U.S. pressure is the "king" of steel Victor Pinchuk, repeatedly honoured by Bill and Hilary Clinton both in public (Steel Conference in Yalta in September 2013) and private meetings. At the same time, the staff at the American Embassy in Kiev has come into contact with other influential oligarchs of the rank of Peter Poroshenko, “the chocolate king" and sworn enemy of Yanukovich and Moscow , as well as the financier Konstantin Zevago. In mid-December 2013, when the square was filled with the opponents of the government, Senators McCain and Murphy went there to harangue the anti-Yanukovich and anti-Moscow protesters. At the same time Victoria Nulan, expert on Soviet then Russian issues, nominated by Obama to be responsible for Eurasian Affairs, convinced the powerful oligarch Akhmetov, until then linked to Yanukovich, to change sides. The deal was to promise that, in a "revolution" carried out by the oligarchs linked to the old regime there would be a sort of boycott of their economic interests in contrast to the aid to those who were noted for a dramatic "democratic change" and aligned with the new course. On the other front, that of the political organisations that were present in the Euromaidan the ever-present McCain was operating. Whilst Nulan was working alongside the oligarch Akhmetov, the Republican senator went to dinner with the founder of the fascist formation Svoboda, Oleg Tyahnybok. In conclusion, from that moment on private TV stations belonging to Akhmetov began to put out programmes, surveys and news favourable to the revitalised pro-western Euromaidan protesters, until the ignoble flight to Moscow of the inept and ambiguous Yanukovich. Yanukovich’s ineptitude is due to his almost complete political subordination to the oligarchs who did what they liked under his administration without him having either the courage or the strength to act with autonomy and authority. His ambiguity is because the character in question, while aligned to the geo-political needs of Moscow even up to refusing to sign an agreement with the EU wanted by pro-Western elements, the "casus belli" of the Euromaidan uprising, has never given up the national tradition of bureaucratic political deceit and corruption. He always kept one foot in at least two camps, taking orders from Moscow, but looking after his private interests through an American adviser, John Podesta, President Obama's personal advisor and leading political consultant to a certain Paul Manafort who works in the electoral field in partnership with the Rick Davis who has shared political experiences with Senator McCain. In addition, after the flight of Yanukovich to Moscow, the former CIA chief John Brennan has remained on Ukrainian soil with the task of protecting and advising the new transitional government and completing the work of preparation for the Ukrainian general elections scheduled for May 25. The other part of the strategy involved the attempt to sever the umbilical cord that ties many Eastern European countries and some of the west, such as Italy and Germany, to the Russian energy supplies via Ukraine or make it more difficult. In practical terms, the U.S. would pursue the prospect of freeing Europe from Russian energy hegemony as a condition for a re-conquest of Eastern Europe and containment, in that area, of German commercial dominance. The perspective, yet to be implemented in full and not without technical and political problems, would be to replace Russia through the construction of the Nabucco pipeline that reaches Southern Europe and pumps with a series of "links" to a good part of the old continent, demolishing the energy monopoly of the new "czar." Another idea is to supply gas directly from the U.S. as a substitute for Russian supplies, but its feasibility seems to have waned for a number of difficult political, financial and environmental reasons. In fact, the "Nabucco" pipeline that should have been open by the end of 2015, has hardly started. The much-vaunted discovery of vast deposits of bituminous shales in various American states which would not only solve the domestic energy needs of the United States until its long-awaited self-sufficiency, but would also be able to replace Russian supplies to Europe, have yet to be put in action. The deposits and the extraction techniques exist, but their costs are high as is the highly expensive liquefaction and re-gasification processes they need. In addition, even if everything were to go well, it would take at least five years before the American gas would be in a position to cross the ocean to dock in the ports of Rotterdam and London, the only ones which are currently capable of carrying out the first part of this ambitious project. Due to this Ukraine plays a strategic geographical position that makes it, by force of circumstance, a pawn between East and West Europe and vitally important to the opposing strategies of Russia and the United States. For Russia, the same holds true but in reverse. Putin's imperialistic ambition is clearly to regain much of the former Soviet republics by playing on several levels, but most obviously through energy blackmail. This is especially true for the Ukraine, through whose territory pass all the pipelines supplying Kiev, Romania, Bulgaria, Moldova and some Western countries. This inevitably clashes with American strategy which would rather that these countries came under its control through its usual military instrument in NATO. This energy blackmail accompanied by a certain amount of capital availability from the wider sector, has meant that the giant Gazprom could become the single largest distributor of energy towards the former satellite countries, allowing it to build up its own infrastructure, not only in Ukraine, but also in Moldova, where the national oil company has a 51% share in Gazprom itself. In 2013 the volume of gas exported came to 200 billion cubic metres per year, of which 86 went to Europe and, after the failure of the “Nabucco project”, Moscow’s future expectations have multiplied. With the annexation of the Crimea the Russian energy giant can get its hands on important offshore reserves in the waters off the peninsula, previously, providing a discrete energy asset for the Kiev government. The Putin coup has had the double success of administering their own gas fields in the Crimea and excluding the day to day interference of Exxon and Shell, which through the creation of an international consortium, had been able to have on-site control and oust Russia's Lukoil. After the annexation these Western oil companies have raised the white flag and given up the project. All this has been in response to concessions for the exploitation of shale gas to Chevron in West Ukraine and Shell in the east of the country. We should also understand the moves in Transnistria, the pro-Russian region on the southern borders of Ukraine and Gagauzia in this context. In the heart of southern Moldova, it is demanding cession to Russia in an attempt to derive an economic benefit in the form of fees for the right of transit of gas pipelines, or just because they feel more protected under the skirts of the "old mother Russia” than from the promises of much-needed European funding, but comes so loaded with demands for "social sacrifices" and cuts in already meagre public spending. It goes without saying that Moscow discreetly supports these separatist movements with the dual aim of weakening opponents and building the strategic bases of support in the West of Ukraine that it has in the East. Well aware of the U.S. danger, already widely suspected for some time, Putin had decided his countermove well in advance. If the role of Ukraine, for whatever reason, diminished as a transit zone for ​​Siberian gas to Europe, or if the Russian monopoly was undermined by technical measures like "reverse flow", or the ability to recycle Eastern gas from Turkmenistan to the West, using old, currently disused, but easily recoverable pipelines, the "solutions" would already be prepared in Moscow. The first would be to put into operation (2011) the North Stream pipeline that avoids Ukrainian territory, and all the risks involved with it. The N.S. supplies Germany directly via an undersea route in the Baltic, and from there the rest of northern Europe. 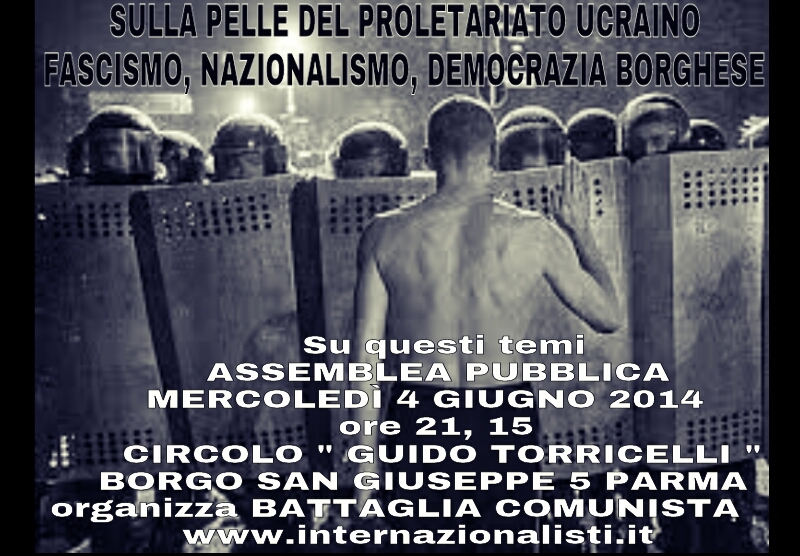 The second as we said earlier is to support, more or less openly, all autonomist demands of the pro-Russian regions. The third is to work against the pro-Western government inspired by American manoeuvres, even in more or less hidden military terms, in support of the Russian-speaking Ukrainian population, such as the birth of the Autonomous Republic of Donetsk on the basis of the referendum of 11 May. All of course is still up in the air but the premise of a further acceleration of the crisis in Ukraine are all there. The third actor in the story that revolves around the imperialist issue in Ukraine is the EU. Apparently, the European Union is tagging along with the intransigent positions of the U.S. backing its criticism of Russia and seconding the request for sanctions as part of the Western bloc. It is the case that many European countries view with concern the monopolistic control of their energy needs by Russia, and as a result, they would like to diversify supply sources and make them safer, but it is equally true that at the moment, for some of them, the relationship with Russia remains unique and indispensable. This is the case with Germany and Italy. Germany gets 40% of its gas and 35% of its oil requirements from Russia via Ukraine. In addition, the German economy has an investment in Putin’s country amounting to 22 billion euro a year which it cannot give up easily. No coincidence that Merkel, although part of the western chorus against the arrogance of Putin, insisted on not abandoning the path of negotiations and will not totally break with Russia. This concept (sanctions but no break in relations) she reiterated in Washington talks with Obama at the end of April. Merkel’s logic is very simple and pragmatic. The raw material for energy comes from Russia to Germany, but since 2011 no longer passes through Ukraine, but through the North Stream avoiding any risk of closure and boycott. Secondly, the pipeline was produced by a Russian-German consortium, which guarantees that Germany is also responsible for continuity of the flow and the amount in transit. This enables it to operate in case of necessity, as the hub of gas recycling (reverse flow) in favour of some Eastern European countries and as co-supplier for northern countries such as Denmark, Sweden, Belgium and the Netherlands in competition with Norwegian gas. Third, but not least, Germany needs to continue an Ostpolitik not only with Russia but also with the other countries of Eastern Europe. For which reasons German imperialism has not fallen into the trap of the Americans in the form of the moral blackmail of “Atlantic loyalty" against Russian expansionism in the Crimea, aggravating the crisis in Ukraine itself and in neighbouring countries. Merkel has played her cards on many tables. She has added to the chorus of condemnation of Russia's behaviour showing herself to be the defender of Western interests. At the same time she has continued the work of economic penetration of the East in competition with the United States itself. It is no coincidence that during the Euromaidan demonstrations she did not line up with the fascist right alliance supported by the U.S., but chose her own candidate in the shape of Vitali Klitschko and his democratic right wing party, Udar (Punch). She has not clashed with the unrealistic American moves. She was in favour of the sanctions, limited for the moment, but without closing the door on negotiated solutions, i.e. without breaking economic and political relations with Russia. Immediately after the Odessa events Putin took advantage of this opportunity, right in the middle of the U.S. proposals aimed at imposing more stringent sanctions against Moscow in their statement on May 7. This called for Russia’s consent to the presidential election of 25 May, for the withdrawal of troops from the borders with Ukraine and, more important, for pressure on the pro-Russians to postpone the request for a referendum on secession from Ukraine and a probable application for accession to the Russian Federation. This referendum which, of course, was held all the same (on May 11) as it was in the programmes of the both the secessionists and Moscow, had an almost plebiscitary participation and strained even further the relations both within Ukraine and on the international scene. On a lesser scale and with obvious differences, the same attitude applies to Italy. The Italian economy is dependent on oil and gas from Russia for 35% of its requirements with the rest coming from Tunisia and Libya. The latter is, moreover, precarious given the fragility of the political situation inside the country after Ghaddafi, and there are no other immediate options. Not only that but Eni, the Italian energy giant, shares in the South Stream project with Gazprom and therefore is doubly linked to the destinies of energy managed by Putin. Either the South Stream project is doomed to failure or it requires significant upgrading with the more modest TAP pipeline, but Eni has to stay in the energy game of Central Asia, which — whether it likes it or not — continues to be in the hands Russia. With the collapse of the USSR Western imperialism sang of victory, telling us that the failure of the "Evil Empire" would open up an era of peace, prosperity and progress for all humanity. This false and hypocritical fable, artfully packaged by the dominant ideology of the victorious imperialism, as well as profoundly delivering misinformation to the proletarian masses all over the world, deliberately disguised the contradictions capitalism would produce. In little more than a decade, it has created the most serious global economic crisis for almost a century. It has hidden the fact that this would lead to the same imperialist tensions with the same actors who would only change costumes and theatre of operations, leaving unchanged the capitalist economic basis that is the primary cause all crises. Crisis, tensions, threats of conflict and aggressive action against the living standards and employment levels of the international proletariat make up the framework in which the complex Ukrainian events operate. The final actor in this explosive imperialist story is China. From the beginning of the crisis in Ukraine to the tragic events in Odessa, China has always maintained a low profile. It has never aligned with American criticism, has never agreed for the necessity of sanctions against Russia, it has virtually remained silent watching, merely limiting itself to hoping that the crisis will be solved through negotiations. It was as if to say that it did not concern her, that it was better to watch without going into the merits of the current crisis which was, and should remain, a matter between Russia and the United States. In reality things are not like that. The behaviour of China is, and will, remain in favour of Russia for a number of reasons ranging from the political to its energy security. For years, the various American administrations, including that of Obama, have sold weapons to Japan and South Korea The aim is not only to produce a political deterrent against China but, more importantly, to organise a high-level military cordon around the western borders of opponent Number 1 in Asia. This has forced the Beijing government to allocate new funds for the military build-up that, in 2013, reached a figure of € 95 billion, and is expected to increase gradually due to the intensification of the siege against her. Energy hunger stimulated by China's dramatic economic development, although slowed by the recent crisis, requires the government in Beijing to frantically search for new sources of energy. Initially its demand for gas was partially satisfied by Turkmenistan (fourth largest reserves in the world and sufficiently close to its borders) and Kazakhstan. Then it played the domestic shale gas card which, at the time, thanks to new fracking techniques used in North America, guaranteed by Western companies such as Shell and Exxon Mobil, but came with a number of risks and as well as political and distribution intrusions which the Chinese government could very gladly do without. So the road has still to be one of agreements with Russia for a fixed, abundant and reliable supply for the next few decades. At a recent meeting of the Commission of Cooperation between China and Russia, their representatives, Arkady Dvorkovic and Wang Qishan, signed the historic agreement which provides for the export from Siberia to China of Russian gas through the extension of the pipeline "Siberia Pacific Ocean” to the Chinese port of Kozmino. The formalisation of the agreement between Gazprom and China's CNPC (China National Petroleum Corporation) also includes the export of liquefied natural gas from the LNG terminal in Vladivostok which is nearing completion, and no small point, the overcoming of a number of obstacles that had slowed the timing of the agreement, such as the cost of gas and Chinese financing for the completion of structural works. The agreement formalised on May 21 consists of two extremely significant figures. Russia agreed to supply gas worth 400 billion dollars to China for thirty years. This cannot but push China, if not to support Russia in the "big game" in Ukraine against the United States, into largely assuming an attitude of not hindering Moscow’s schemes. In conclusion, we are witnessing the usual imperialist games, games about power and economic interest which the crisis makes increasingly violent and leads to military aggression and social barbarism which, inevitably, falls on populations, on the proletarian masses, whether directly or indirectly involved. In Ukraine, as in any crisis scenario that is not halted by a revolutionary event, the dominant ideology continues to be that of the dominant imperialism. Western imperialism, headed by the United States, mobilises the masses under the nationalist, fascist banner of national integrity against the "terrorists" financed by the Kremlin. Russia mobilises "its" pro-Russian and Russian-speaking masses and key defence of linguistic minorities with a dusting of anti-fascism for convenience. But in this game there are only bourgeois, capitalist and imperialist goals that have nothing to do with the interests of the working class, which are channelled towards nationalism, or antifascism and defence of democracy according to the various party interests. The example referendum on 11 May, giving birth to the Republic of Donetsk, is a clear demonstration of this. On the one hand, the Kiev government denounced the referendum itself as "criminal". They define as terrorists all those who threaten national unity, thus justifying all forms of repression against the secessionists. On the other hand, the supporters of the referendum, who swept to victory with a 70% turnout and more than 95% of the vote, claim the Autonomous Republic of Donetsk should be recognised in the name of self-determination as a political act against the new fascist government of President Turchinov. The first appeared on the scene as "revolutionaries" of a not too well-defined "democratic right(?)" who fought against the totalitarianism and corruption of the Yanukovich government but really as a direct emanation of Western, in particular U.S., imperialism. The second raises the antifascist banner or, here and there also the red flags of "imperial communism" of the Stalinist historical matrix, both politically manipulated and subjugated to the economic and strategic interests of Moscow. Crisis, tensions, conflicts and aggressive attacks on the already low standard of living and level of employment of the proletariat are the framework around the complex Ukraine affair that, far from being resolved, could lead to more serious consequences for an increasingly precarious imperialist balance which is on the brink of collective collapse. As always, the indigenous proletariat will once again be the main victim of this economic, political and institutional crisis, if it fails to take the difficult road that will lead it into conflict with capitalism and with all political forces who, for various reasons, are the ideological envelope that encloses it and protects it and allows its devastating contradictions to survive. The meagre communist and revolutionary vanguards, wherever they exist or however minimally active they are, should never make the mistake of being dragged into the vicious circle that the opposing bourgeois and the "belligerent" imperialist forces have put in place. There is no supposed democracy to defend, there is no peoples’ self-determination to be invoked and no nationalism to support. All of them are simply bourgeois solutions that have to be fought head on, just as the fascist variant — the usual guard dog let off the leash by capital when the going gets tough — is strenuously fought. Fascism and democracy, pluralism and totalitarianism, nationalism and federalism of the European or the Slavic-Russian type, are nothing more than the varied aspects of a mechanism for the preservation of capitalism and its arrogant imperialist manifestations, from which the proletariat must distance itself if it wants to stop being the usual mass movement acting in the interests of the class adversary at home and abroad. The trap that is inevitably set in situations like this is that the fight against fascism and imperialism goes under the banner of the eternally mystifying United Front, politically obligatory, it turns up on every occasion. In this case it is in the form of the self-proclaimed “Left” of capital who, backed by the usual old Stalinist formations, preach the need for a common front against the same old enemy: U.S. imperialism and its nationalist-fascist allies, in order to support the other side of the coin, which is just as nationalist and imperialist, represented by the pro-Russian front that they are so determined to consider peaceful, democratic and progressive. The real issue is that the militarised gangs of organisations such as Pravyi Sektor and Svoboda, in the service of Ukrainian nationalism and in tow to American imperialism, must be fought like the pro-Russian secessionist militias of eastern Ukraine, piloted by Moscow’s imperialism. For the Ukrainian proletarian masses, caught in the devastating grip of an economic crisis that has reduced them to hunger and poverty just as at the end of World War II, the choice is not whether to stay with the "chocolate king" Poroshenko or hope for the second coming of Yanukovich, if you listen to the sirens of EU and U.S. aid or run under the "reassuring" skirts of mother Russia. They do not have to choose between two different types of corrupt oligarchies on the domestic front, just as there is no distinction between the imperial rapacity of Obama and Putin on the international stage. They have to start fighting capitalist relations of production, their economic effects, and the political forms that support them, and most importantly, they must be afraid of everything which under the name of tactics, takes their anger and despair into this or that bourgeois camp. The United Front, however, is just the opposite: it confines the anger of the masses within a civil war without running the risk of it becoming a class struggle against capital. It identifies its adversary as one of the components of the civil war itself and in only one of the sides that the imperialists stir up from the outside. It makes sure that the system as a whole remains unchanged, changing only the directors of capitalism’s domestic political management in the name of anti-fascism, democracy and nationalism rather than anything else. But it leaves the system of economic exploitation intact with its corollaries of crisis, greater impoverishment, and wars fought for the interests of others. The tactic of the united front policy has always been, is and will be, the tomb of the revival of the class struggle and, consequently, it is one of the best tools for the preservation of contemporary decadent capitalism, violent bearer of economic and social barbarism as the Ukrainian scenario is now showing. [i] After Rome defeated Carthage for a second time the Roman Senator Cato (the Elder) always finished each speech (on whatever subject) with the words “Carthago delenda est” or “Carthage must be destroyed” which did eventually happen in the Third Punic War. Our comrade has changed the quote to the past tense to show that the USSR had already been destroyed but this has not stopped the onward march into its former empire by the West.